Shortstop is another tough one to vote on, huh? What about Brian Bocock and Miguel Cairo? Chase d’Arnaud was one of the coolest cats to ever play at Coca Cola Park. He did a great interview with us and had young fans stretch with him before games. This was before even formed a band and recorded an album–but it would have been cool for him to play at Tiki parties, wouldn’t it? A fine candidate. Andres Blanco as you may know, is the only player to ever cause me to go full-on “fan boy” in the clubhouse. I try to behave myself in there, lest I get kicked out, but also out of respect for those who have jobs to do–the players, coaches and even the “other press.” But he drew it out of us–me and DiPro–and “ruined” that video forever. “Let’s Go Blanco” also got me in trouble for “yelling too loudly” during the games–there’s another story to tell some day. Freddy Galvis always seems to have a smile on his face as he plays the game he loves. He came to us late in 2011, just when we were trying to make the playoffs for the first time, and he rose to the occasion and helped us do just that. Since his promotion, he’s been a utility guy and a full-time shortstop for the Phillies. JP Crawford is blessed with fielding and hitting tools the likes of which we’ve rarely seen. He’s one of the youngest players to ever wear the IronPigs uniform and one of the top prospects in all of baseball. Where will he go from here? His future is unwritten, but he’ll be back and he won’t rest until he takes the next step–and probably not then, either! Despite our “relationship” with Blanco, and my personal preference for JP, the NoiseNation endorsement goes to Freddy Galvis for his overall contribution to the Phillies system, and his time spent with the team. 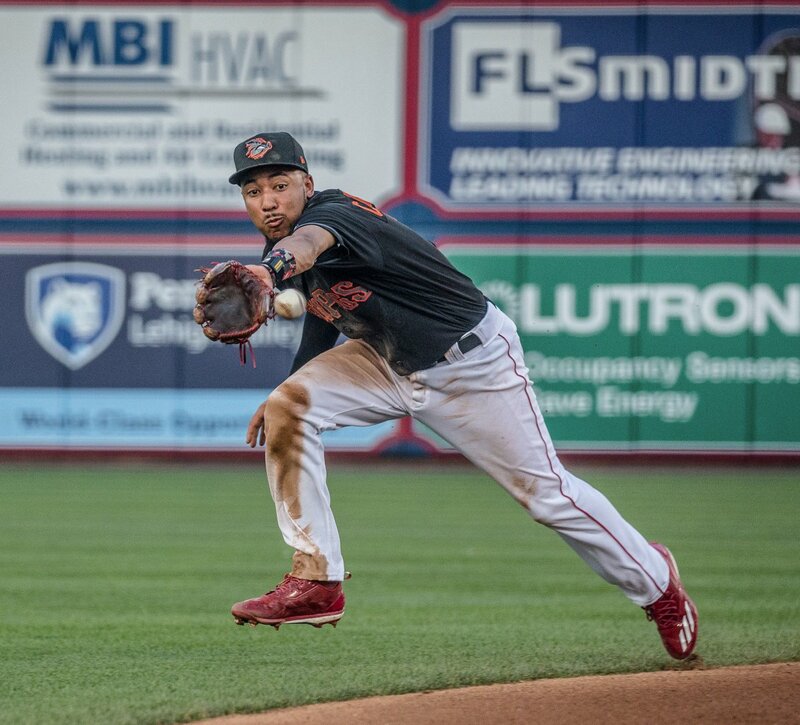 VOTE NOW: Which Shortstop should represent the IronPigs on our 10th anniversary team?